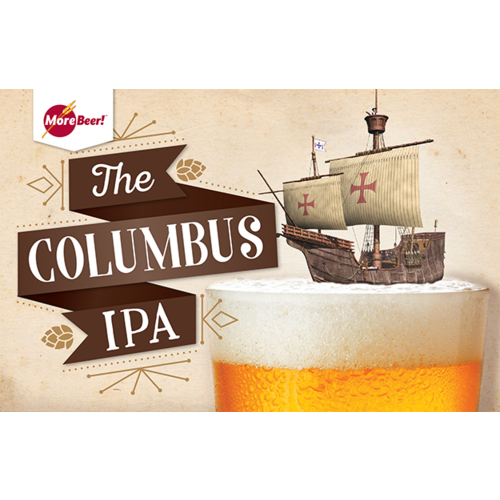 (Makes 5 gallons) An IPA recipe that features the high oil content Columbus hop in the finish. Lots and lots of aroma combined with very evident hop flavor. The Columbus hop flavor and aroma help work to soften the apparent bitterness. The malt extract and grain remains the same as the American IPA recipe. I've had it before and liked it. Love Columbus Hops. Will dry hop my Columbus 2018 crop. Bought this brew before and loved it. Solid beer, only one bad batch in two years and it was probably my fault (no carbonization). Friend and I used to do all-grain brewing, and decided to go the extract route this time. The kit had everything you need (except for yeast) to get your beer going... everything packaged neatly and nicely, and came within two days. Would recommend this kit to anyone looking to get into making beer with extract. I've been brewing for a few decades experimenting with different combinations of malts, hops and yeasts. Fresh Columbus Hops serve as well as any hop I've tried for a bitter, flavor, or aroma hop at any price. This kit resembles on of my recipes. I add an extra 4oz of Columbus hops for flavor and aroma to this recipe. I use White Labs California Ale Yeast. In your face hops with abundant grapefruit notes. Delicious, juicy beer! 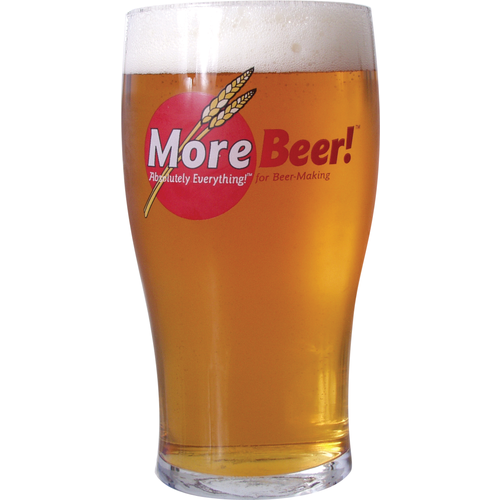 I have brewed this IPA multiple times and it always gets rave reviews. I love it ?? Great tasting beer would recommend to all. Bought this kit because the price was right, but am a little disappointed. Not a complex flavor in any respect and overall it tastes like hops were added for the sake of adding hops... the result is an average tasting beer with way too bitter of a pallet. This is my first home brew and I'm glad I started with this kit. I have to admit I was nervous as hell throughout the whole process, worried that I screwed up a step along the way. But after two weeks primary, and two weeks conditioning in the bottle I got to finally sample my brew last weekend and was really blown away. My first thought was, I would definitely buy this if it was offered in a store. The aroma was just right, and the color was perfect, a dark amber, just a bit cloudy. I would describe the texture as almost creamy with just the right amount of hop bitterness. Carbonation after two weeks was spot on. I really didn't deviate from the instructions that came with the kit and am happy with the result. I'm totally hooked now, and will be starting my next batch this weekend. I have brewed this in the past and it was great beer. It came up on a deal of the day and which basically makes it shipped for free. This will probably become a regular in my IPA brews. I cant say how this was straight up by the recipe because I used it as a base for an IPA hop experiment batch. But it turned out great gravity was right on enough malt to stand up to a lot of hops and very smooth. Used Us-05 yeast fermented fully within 3 days let it sit for 7 days dry hopped for 5 and tested one at 7 days after bottling and already has a nice carbonation. No problems would definitely order again! I brewed this IPA when it was first offered and many times since. I have become somewhat of a Columbus hops junkie-- find myself seeking it out in other IPAs. Great stuff. Just can't get enough of this amazing recipe. This was a great beer, and lived up to the description. But if you are looking for a bitter IPA, you might consider a different kit. this was one of the first brews i ever did and they made it so e3asy and the product was so good, I couldn't hepl to get hooked further into brewing! I was expecting a more bitter flavor with all those hops. No changes from the recipe, came out 1.056 OG which I thought was a little low. 10 days in primary, 18 days in secondary, force carbing in fridge now. Pulled a glass when kegging, 1.007 FG so I'm at about 6.5%. What a fantastic aroma. Very complex; I can't stop trying to figure out all I'm picking up. Someone above said tangerine and kiwi, I'd say that's spot on. I'm very pleased. Wedding's in 3 days...should be a winner. 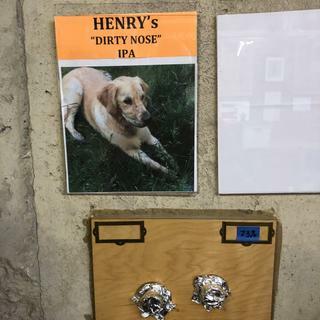 I have shared this brew with friends and co-workers. Some are well-beyond my experience level as a home brewer, so I valued their opinion. They liked the color (darker than the image shown) and clarity and felt the malty tones were a bit out of balance with the carbonation and bitterness. I had kegged this batch and flattened my sample bottle through poor filling practices. So with better carbonation and another week in a refrigerated keg - it is now balanced and was gobbled up at a recent birthday party. Maybe it was gobbled up because the other option was Corona... But I heard nothing but compliments and please bring two growlers next time, or the whole keg! Will make again. Only a gallon left and need to knock the next recipe off my list. I've brewed this multiple times and its delicious, too easy to drink and wonderful! If you like IPA, this won't disappoint. This is an awesome kit! Great single hop IPA. Not too chewy, very drinkable. My wife loved this brew. I have been enjoying this beer for the past few weeks. It has a dry hop flavor that is not too bitter and reminds me of under-ripe berries. I quite enjoy the character of the Columbus hops. However, the aroma is a bit too subtle and I would have liked a bit of malt character to balance out the hops a bit. If I make this again, I will certainly tweak the recipe a bit. This is my go to IPAA. Although I like Citra better, I can't afford it. This is a go to IPA for me easy and Fast fermentation! My friends and family think is the best IPA I have ever brewed. I am amazed that such an easy brew is this good. This is a well balanced hoppy beer that came out great for me. I'm brewing it again this week for a picnic. A great ipa. I have done this kit twice and plan on doing it again soon. Of all the batches I have brewed this is been my favorite. However, after about another two weeks, some of the hops flavor dissipated. I know that is typical in IPA's, but seemed quite fast to lose that much flavor. Still an excellent beer, but not as good as the first two week after bottle conditioning. So, drink it fresh and drink it fast! It's a nice IPA for the price. I added one oz of Amarillo hops to my secondary for 5 days and it gave it a nice flavor and a great aroma. I still like Nate's Hop Bomb as my number one chose for a good IPA. I have got this at least twice and it has been very good. Good IPA and very strong. I ended up with 7% ABV which definetly has more kick than your average 4-5% ABV. I brewed 1 week in primary, dry hopped for 2 weeks in secondary and let sit 4 weeks in bottle. I tried after 1 week but was almost to hoppy, so let it mellow out some. It came out good but a little to hoppy for me, I will brew again but skip the dry hopping. Good clean flavor, very high in bitterness, but not excessively so. Not a lot of hop aroma, some hop flavor. Could be improved by dry hopping with another ounce of Columbus hops. Good body, clarity, color and head retention. A really good basic IPA (on a par with many of the better commercial IPAs). Very well received by my brother-in-law and his friends at New Years Eve party. Of course I'm talking about my first beer I brewed. I echo Mike D's comment. This is an easy brew and one your friends will be impressed with. This is a wonderful beer. I've brewed a lot of IPA's and this is one is hands down my favorite. It even got a BRAVO from a fellow brewer friend and IPA lover. I brewed it pretty much to recipe except for a couple of minor things... I put half the extract in for the 60 minute boil, and added the last half of extract at 15 minutes. This lightened up the color of the finished product quite a bit. I fermented for two weeks at 68 degrees in primary. I also cold crashed it at 32 degrees in the secondary for two weeks prior to bottling, and added one ounce of cane sugar to the 4oz of corn sugar at bottling time to bump up the carbonation level a little bit. The result was a light, fresh, crystal clear IPA with a very crisp finish from the added sugar. I HIGHLY recommend this to anyone brewing this kit as it just made it "perfect". The only problem is, my ABV came out to be 6.9% and it goes down WAY too easy on a hot day! After tasting this, Columbus hops have become my favorite for an IPA. Loaded with aroma, wonderful different flavors (peach, kiwi, citrus, tangerine), and not overly bitter. If you like IPA's, do yourself a big favor and brew this one up. I just opened my first bottle (or 3) last night after 1 week in the primary, 2 weeks in secondary, and 3 weeks in the bottle, and it is very good. Nice and smooth with a good hop taste. This is the first IPA I've brewed and already have plans for brewing two more (different types). When making this I debated dry hopping it, but decided not to and I'm glad I didn't. It's just the right amount of hops for a non-hophead. I also ended up with about 7% ABV, which I felt after the 2nd one, and called it a night after the 3rd (it was a week night after all lol). A favorite over the years. I don't remember all the times I've brewed this one, going back 10 years probably and it always turns out great and all hop lovers are impressed! Good IPA by itself, and I had fun adding different hops. It was easy to trade out Columbus for Falconer Flight aroma hops. Very good extract IPA, I've received a lot of compliments from my friends (plus I like it a lot). 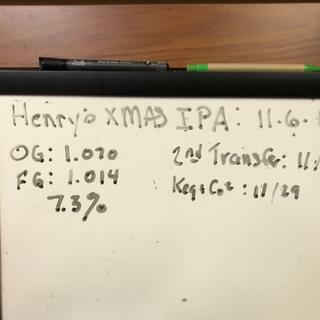 OG was 1.064, FG was 1.011, ABV after bottling was 7.1%, so stronger than indicated in specs. Used US-05 dry yeast to showcase the Columbus hops. 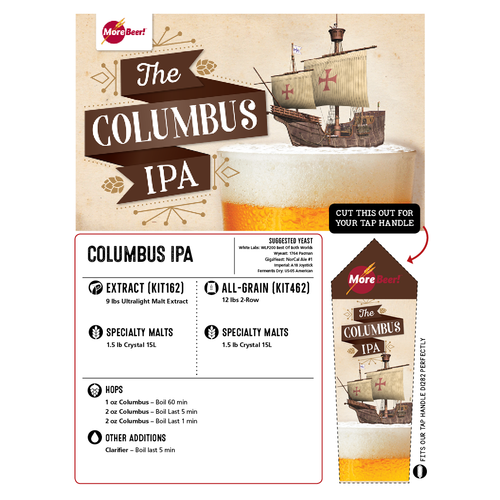 Made to instructions, except dry-hopped with 1 oz of Columbus leaf. Very nice aroma, good hop flavor. Good bitterness, but won't blow your head off. Very well-rounded. Nothing really special about it, but it's just GOOD. This kit is often marked down in price as a daily deal...well worth the pickup, as it's an extremely good value compared to LHBS prices.